The Makito AIR is an HD H.264 encoder with 3G-SDI, HD-SDI, SDI, Composite and S-Video inputs in a military specification appliance with metadata capabilities. The Makito Air incorporates the unrivaled performance and power of the Makito HD H.264 encoder in a ruggedized chassis and couples this with full KLV/CoT metadata capabilities. The Makito Air addresses the most demanding intelligence, surveillance, reconnaissance (ISR) challenges by delivering H.264 from standard definition up to 1080p60 video with metadata to IP with as low as 55 milliseconds of latency. 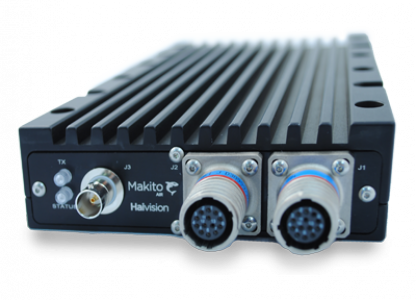 The Makito Air fully benefits from Haivision’s experience in developing the Piranha to become an essential workhorse of low latency video backhaul for ISR programs. The Makito Air is based on the same chip level components, circuit board, and firmware as the “commercial off-the-shelf” Makito encoder product. As such, the Makito Air benefits immediately from Haivision’s progressive developments that address a wide variety of performance markets bringing to the Makito Air a powerful feature set including: HiLo-Streaming, scaling, de-interlacing, bandwidth control, and snapshots. The Makito Air is compact enough to mount 3 units in 1RU and weighs less than 3 pounds.